First up is the last one I thought of. A 1950’s inspired floral design for the laced and threaded stitches Beyond TAST challenge. I may use felt for the basic shape of each flower but I haven’t really decided yet. Next up is the outline for the woven stitches challenge (I won’t be stitching the cloud). I have a real fondness for wooden building blocks, and this sampler will feature some little block houses and a tree. I’m going to trace these onto the background fabrics using dressmaker’s carbon paper right before I start stitching. 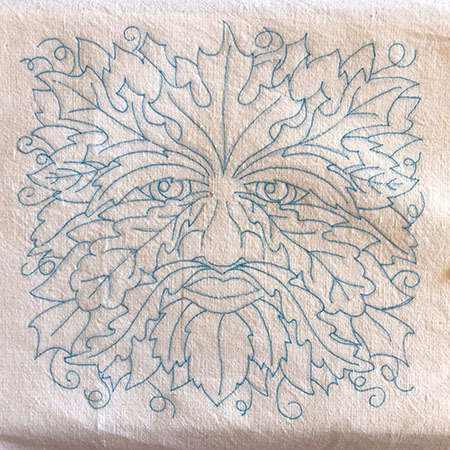 I think this one is going to be a great deal of fun to stitch. The last sampler is a purchased design. I’ve loved the Green Man design from Urban Threads since I first saw it a couple of years ago. 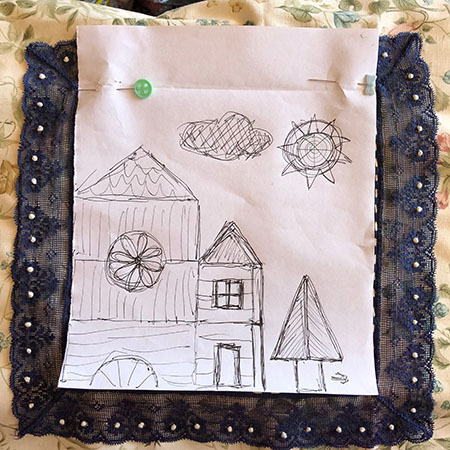 I’ve worked an Urban Threads design in TAST before for my satin stitch sampler. If you buy the hand embroidery versions, they’re very inexpensive, and even though they’re not really designed for hand embroidery they are a lot of fun to stitch by hand. I’m going to use this one for the “filling stitches” challenge, which is possibly insane. Okay, probably. I have a vague idea about how I want to tackle it with colour and texture to create dimension, but I’ll probably change my mind thirteen times before I get to it! I think there are only one or two more Beyond TAST challenges left before it finishes at the end of the year but the Take a Stitch Tuesday stitch challenge is going to run again next year. Check out the TAST FAQ page over on Pintangle for more information, or have a look at all of my TAST and Beyond TAST samplers so far. Beyond TAST is up to season 8 but I’m catching up slowly! I’ve just finished season 5, line stitches. Because I experimented a lot with all of the stitches when I did the Take a Stitch Tuesday challenge in 2015-2017, I sometimes like to narrow down what I’m going to do in my Beyond TAST embroidery samplers. 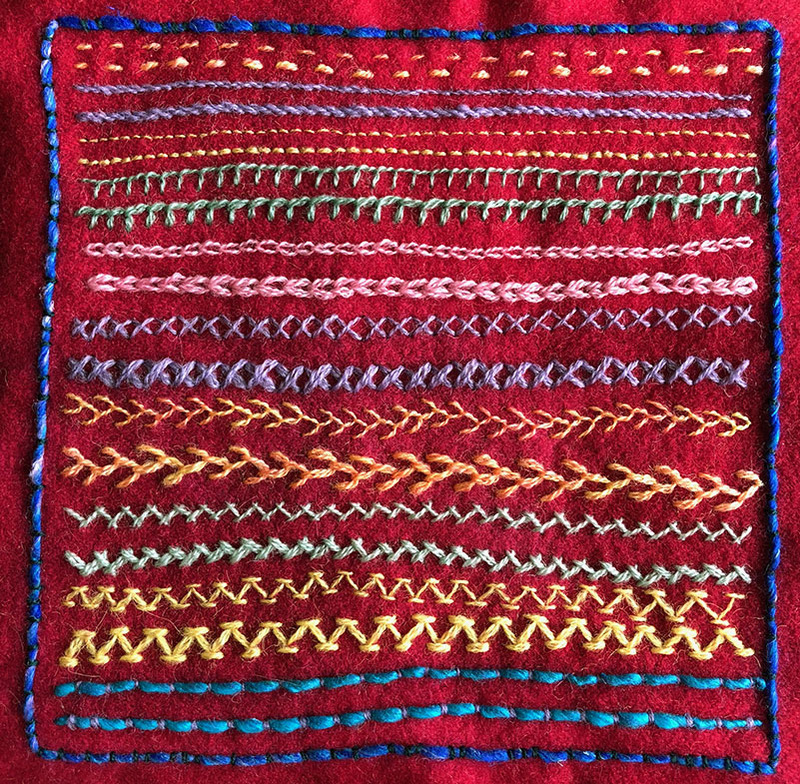 For example, this season’s challenge was to explore line stitches. I chose to use wool threads on a woollen background. Specifically, some pieces of the old blanket I cut up and dyed a while ago. I have a bad habit of almost always using a double thread when I embroider with wool, so my first sampler is a small selection of basic line stitches worked in a single thread, then a doubled thread. I made this for future reference, so I don’t stick to my current habit of “double up all the woollen threads”. The threads I used are DMC Medici, Appleton Wool and DMC Floralia. Oh, and a local hand dyed wool (the orange), which I promptly lost to tag from (oops). The couched thread is Noro wool/silk something or other. It’s one of my favourite thick yarns for couching that I bought at the op shop (charity second hand shop) a few years ago. I’ve used it a lot in my Take a Stitch Tuesday samplers. I’ll be sad when it runs out. When I think of things with lines and stripes, the bands on rocks and stones are one of the first things that come to mind. Nope, not zebras, or candy canes! I made a Pinterest board of stripy rock research photos, and came up with the idea of making a sampler of stripy stones. First I stitched the pebbles down with silk sewing thread that matched the stones as much as possible. (I. E. Not very). 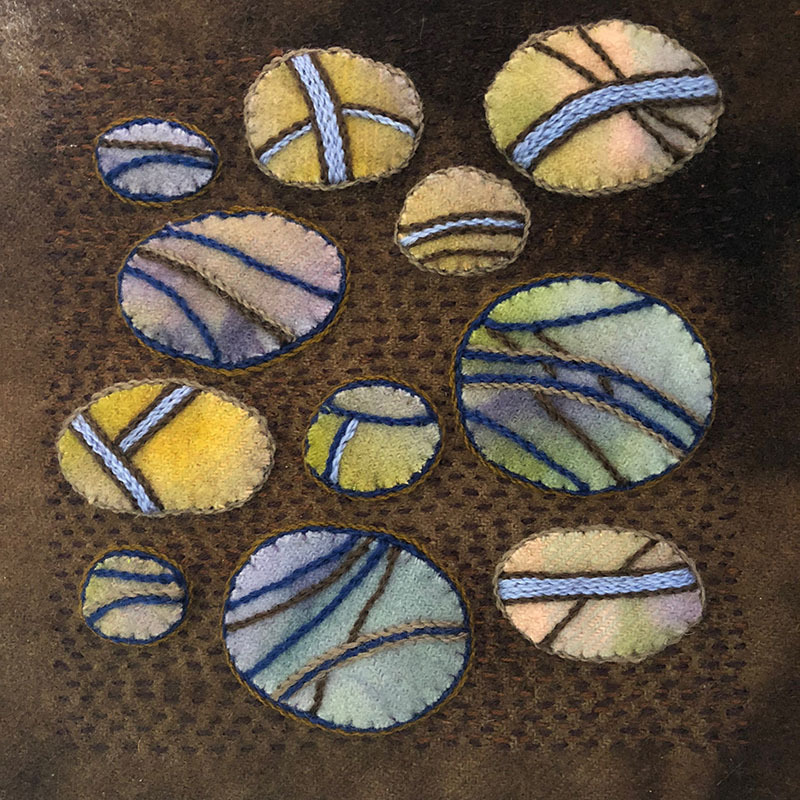 Then I embroidered the stripes and outlines in stem stitch, and finally worked running stitch across the background in two colours to give the stones more depth and the background some texture. I worked a dark purply brown all over the background, then added a lighter brown in a couple of sections for more visual interest. I’m very pleased with the result. You can’t see how three dimensional it is in the first photo so here’s one taken at an angle. You can see the lighter shade of brown I used in the background clearly in the bottom right hand corner. 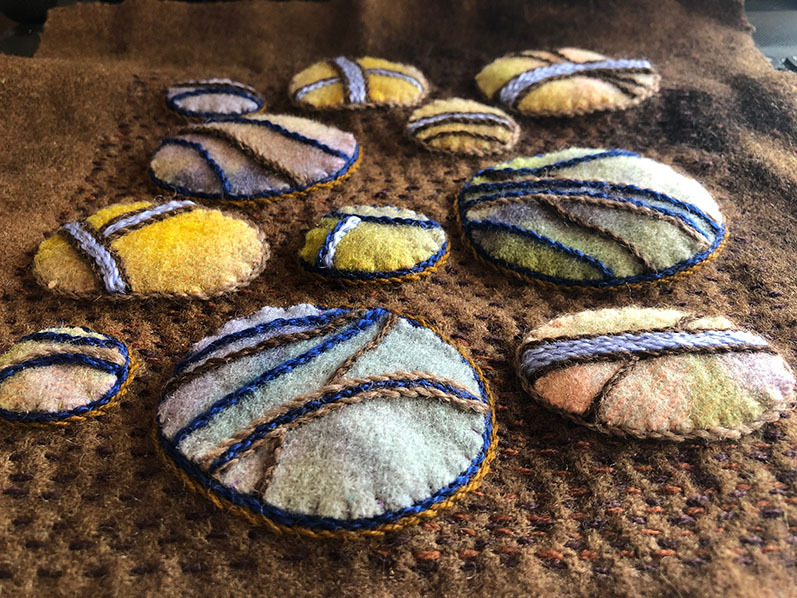 The running stitch really made the pebbles “pop”. I’m super happy with the results and may need to dye some more blanket pieces in lighter colours to expand my stash. I mentioned earlier that I had already experimented with line stitches a lot when I worked the 100 stitch TAST challenge in 2015 to 2017. Knotted Cable Chain, which I worked in a large range of threads from super skinny size 12 perle cotton to super thick Lopi knitting yarn. The same post has Portuguese border stitch and zig-zag coral stitch, which are also great line stitches. Triangular feather stitch. This turned out to be a lot more versatile than I expected. Raised chain stitches and reverse buttonhole bar are two very textural line stitches that I really enjoyed experimenting with. 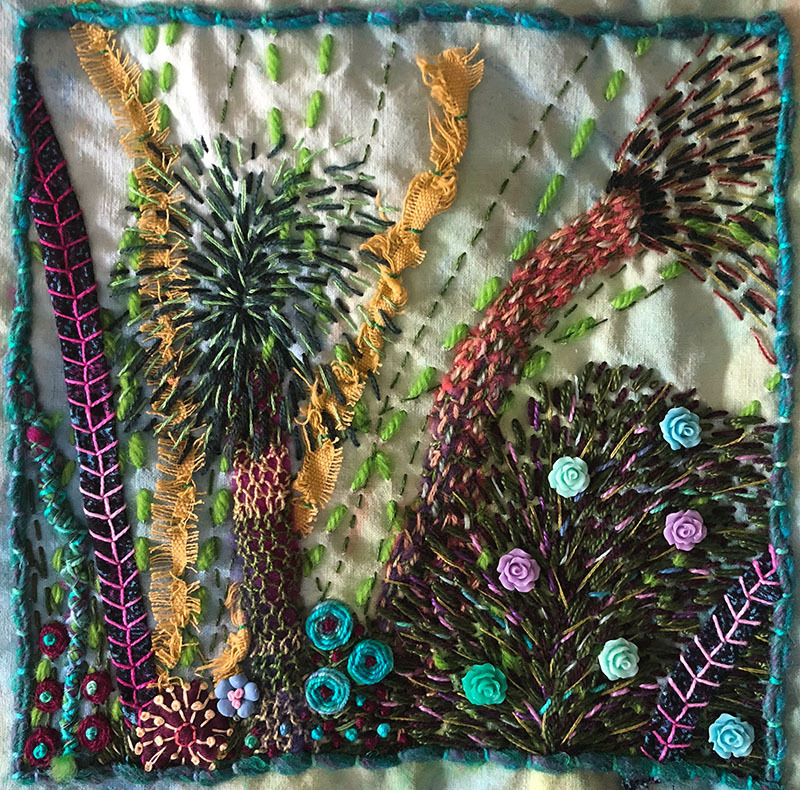 Feathered up and down buttonhole (in the middle of this rather long post), is a wonderful stitch for natural elements like vines and cacti. It can be random enough to have a very organic feel to it. Beaded oyster stitch. I added all sorts of beads and trinkets to this one. It can be a vert arty looking stitch, and very expressive. Alternating buttonhole stitch is also featured in this post. I enjoyed how graphic it can be when worked on striped fabric. Pekinese stitch. I love how versatile this stitch is. It can be used as a filling as well as a line stitch. It can be worked in tiny threads for an antique look, or thick, soft cotton for a retro looking piece. Shell and wave chain. I worked them in white sashiko thread on a vintage cotton serviette. I love the graphic quality of the white stitches on the dark background. Magic chain. It was fun to play with both colour and thick and thin threads. Fern stitch. Another lovely stitch for leaves and natural forms. Buttonhole/blanket stitch. Check out those circles! Half chevron stitch. I absolutely loved this stitch. I used it to make lines of stitching to form a landscape, using at as both line and filling in one go. It has a lovely movement to it, and is a great stitch for layering. Stem stitch. How can you not love stem stitch? It’s just about the most versatile line stitch there is and makes an amazing filling stitch, especially dimensional when you use wool. Satin stitch. Would you count satin stitch as a line stitch? I’m not sure, but you can embroider great lines with it, especially working it over a padding thread. Feather stitch. I’m still very fond of my little embroidered underwater scene. Cretan stitch. Worked in a variety of threads and thicknesses, cretan stitch has a lovely painterly, artistic quality to it. The final two stitches, and the ones that completely have my heart and I could play with forever would have to be couching, and running stitch. Both are incredibly versatile and energetic. I feel like I’ve linked to just about everything, but I promise I haven’t! The 2015 – 2017 Take a Stitch Tuesday (TAST) challenge covered 100 stitches, and I think I ended up working 115 or so. The first thing I did after uploading the new version of the website was to get straight back to my Take a Stitch Tuesday samplers. (You can click on the photos for a closer look). 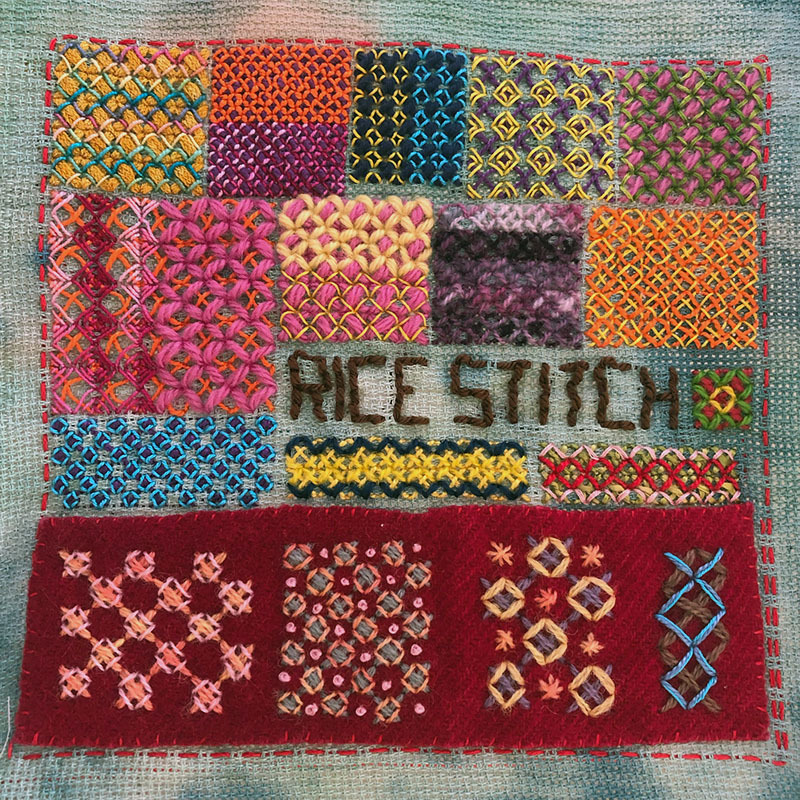 Rice stitch. We didn’t work rice stitch for the last TAST, so even though I’m working on Beyond TAST challenges now, I decided to work up a sampler to add to my stitch books. At least, I hated everything I worked above the words. Then I decided to sew on a scrap of wool blanketing and work freehand and I loved it. It turns out that what I really didn’t like was the floppiness of the fabric as I’d washed out all the sizing when I dyed it. If I have any of this fabric left I’ll definitely starch it before stitching on it. I almost always wash my samplers after finishing them so it shouldn’t be a problem. Speaking of washing, check out how much the orange crochet thread at the top bled! I definitely won’t be using that in embroidery again. I do love it though, I’ll just keep it for some single coloured crochet. Normally, I’d try washing it out but it doesn’t really bother me, what with the multi coloured background and the fact that not much will show once it’s mounted into a book. I didn’t really notice it until after I took the photo. Next is my latest sampler for Beyond TAST. Exploring layered stitching. I decided “layer all the things!” would be my premise so I gathered up strips of fabric (cut from previous TAST samplers), unspun wool scraps, and just about every type of thread I own. I even glued on some little plastic flowers. (E6000 glue is just as magic as I had been led to believe). 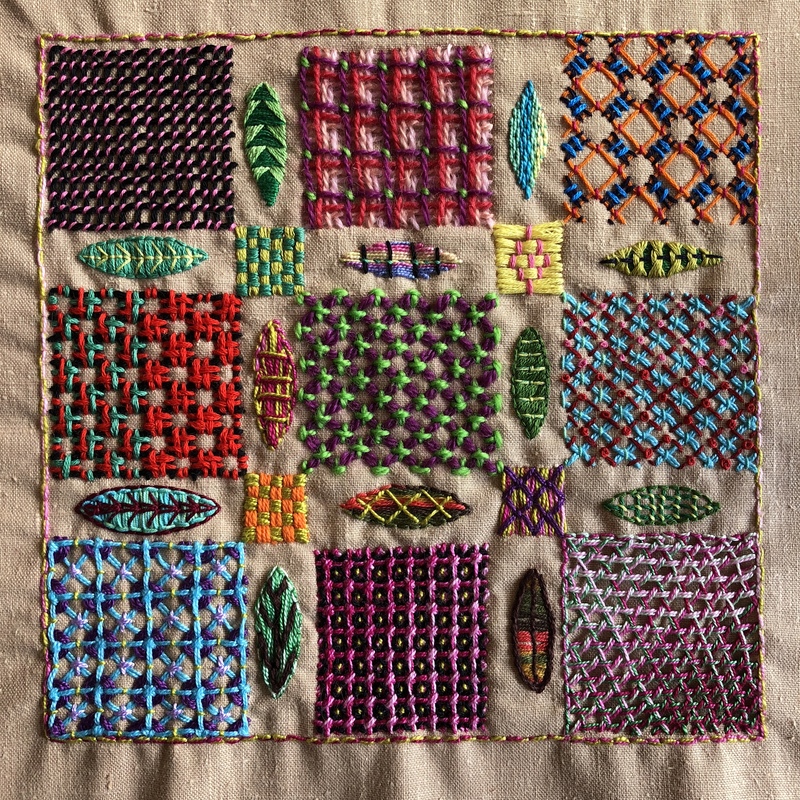 I found one of the most interesting parts of this sampler was the layering of colours. I the flower bush, I had worked many shades of green and brown before sticking on the little plastic flowers. Once they were stuck on, they didn’t look like they belonged until I added lots of stitching in the flower colours to tie them in with the background shrubbery. If I were to try this again, I might even go as far as needle felting all sorts of things into the background. I had intended to here but after painting the calico, my embellisher probably would have just shredded it rather than incorporating any fibre into it. Next up, I’m working on exploring line stitches. I’ll probably end up with two or three 8 inch samplers as there are a few different things I’d like to record. After working my last couched fillings sampler for the Beyond TAST embroidery challenge, I couldn’t resist the urge to push the idea a little further. Whilst traditional couched fillings are lovely, they aren’t a style of stitch I would use on most projects. Presenting my “slightly more ‘me'” couched fillings sampler. These stitches are worked on quite a large scale using needlepoint and knitting wools as the couched threads. As you can see, I tend to like large graphic elements rather than small, tidy fillings, although I would probably work these in a range of different scales on an actual project. couching a double strand of yarn and separating in to make diamonds and circles, some of which I filled with a satin stitch shape. Brown wool couched down with fly stitch. Pink wool couched with random straight stitches. A version of plaited filling. A leaf with green needlepoint wool couched down with straight stitches in an offset brick pattern. Of course now that I have said these fillings are more my style, I’ll probably go and stitch something huge using both! I have a lot of embroidery posts to catch up on this week, so stay tuned for more! * This is an affiliate link to Rebecca’s CreativeBug class. I may receive a small payment if you sign up to CreativeBug after clicking this link. 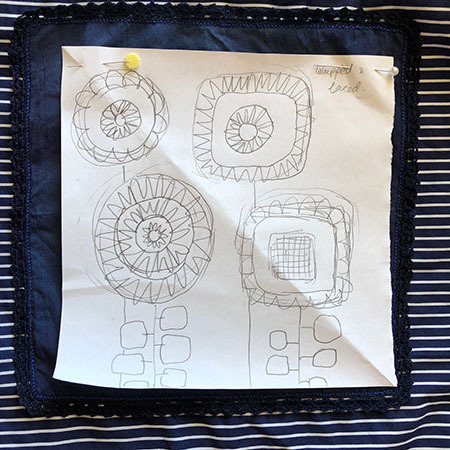 For the third Beyond TAST challenge, we explored laid work fillings and creating patterns using couching. 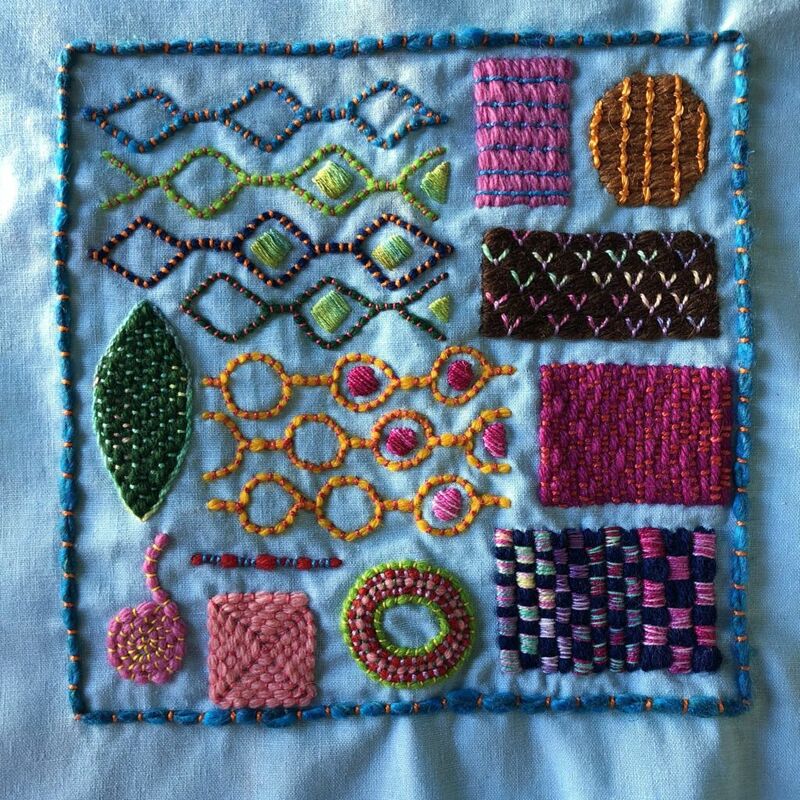 To find instructions for all of the techniques I used, check out my Laidwork Pinterest Board and “Embroidery Stitches” by Barbara Snook. You’ll probably find instructions in any embroidery book that has more than the basics.